As much as Americans might like to think we are idealistically superior to the Brits, having soundly trounced them in the Revolutionary War in order to “pursue our right” to have no king or man tell us what to do, there comes a time, and with respect to certain individuals, we need to realize that some of our best character traits (genetically, culturally, and spiritually) stem from across the Atlantic. Such a representative individual would be Annie Hardwick who is in charge of the pre- and post- surgical ward for our Mending Faces cleft palate/lip revisions. Although Nurse Hardwick would say she detested the idea of spawning children, she in fact nurtures, mothers, and places healing hands on our young and beautiful patients every day. She is responsible for minding the shop that cares for all the children who undergo the surgical correction of their cleft lips and palates (some quite severe and deforming). It is a feat that requires loving patience and extreme endurance, which I would question my ability to muster. Annie has worked as a nurse for years, and an impressive, and versatile résumé she has. Born in Nottinghamshire, U. K., living for a few years in Canada, and then returning to Derbyshire, U.K., she has worked in midwifery, pediatrics, gynecology, and is currently a stroke research nurse for the Lincolnshire Clinical Research Facility in the United Kingdom. Oh yes, she keeps bees as well. 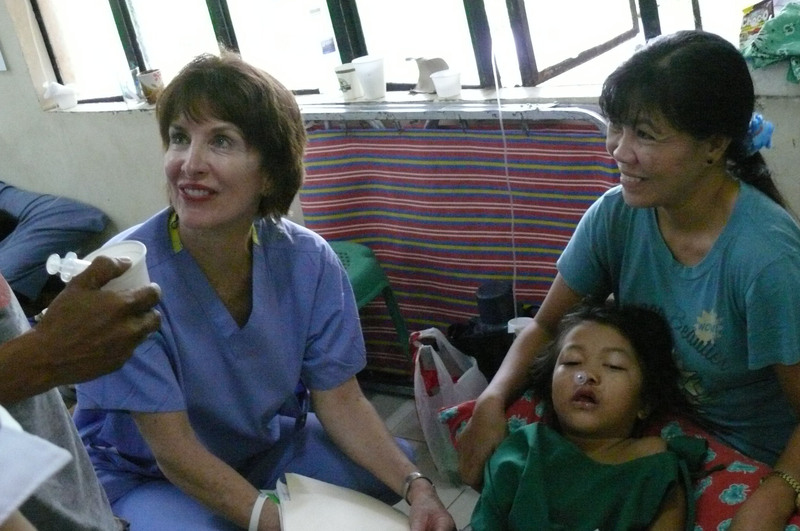 A typical day on the ward might include 30 children, with 2/3rds being post op. With these children you have their mothers, sometimes fathers, and their siblings; grandma might be there too. They lay on small “camping” cots with no more than 3 feet between them, and if the whole family is there, they all sleep on the same cot. IV’s are strung along the wall on clotheslines. Very few children cry, but most are extremely well behaved. This is a pointed reminder of how we Americans have allowed our children to run amuck. The ward’s overflow patients line the hallway outside along one wall; the other wall is already taken up with women who have given birth or about to give birth making it even more confusing. The parents are smiling and grateful and remarkably trusting of these perfectly strange and pallid foreigners who are about to perform surgery on their children’s mouths and faces. Some of the younger children cry hysterically if approached too quickly by one of the white giants (the Philippine people have darker skin tones and are diminutive compared to those of us who are of Northern European extraction), and since many of these children have been victims of malnutrition, they are even smaller than the norm. As we attempt to guess their ages, we discover that they are years older than what we first assumed. Yesterday, I saw an unbelievable sight, from an American perspective: asleep on a cot was the cleft lip and palate patient, his Mom with his 1-month-old brother (also a cleft, but too young for surgery) at her breast, and his older sister. Count them….that’s 4, all neatly nestled together, soundly asleep, in 85-degree heat (no air conditioning) accompanied by an unsettling decibel level. 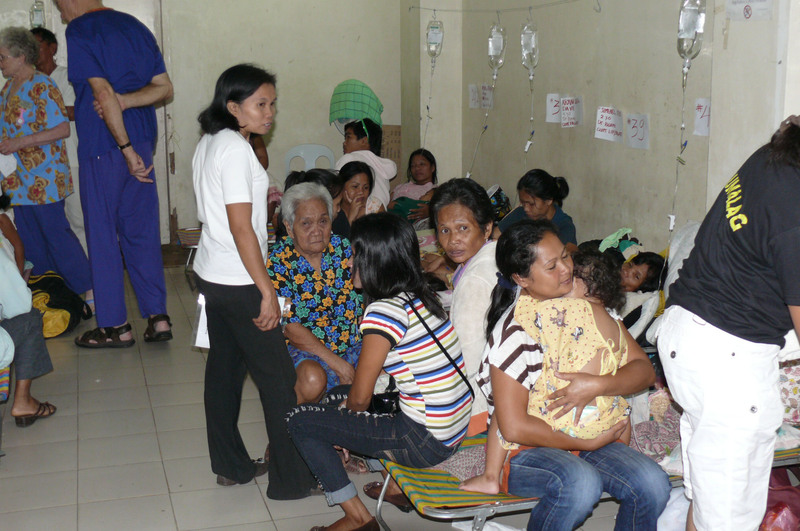 The current tropical depression hovering over the Philippines, drumming inches of rain onto the hospital corrugated tin roof, creates a humidity level of 99% indoors…100% outside, of course, and the chaos of all those families in one room is truly an experience not soon forgotten. And mention must be made of the skulking hospital cats that keep darting in and out of the open doors, windows, and slinking about between beds and nurses feet. Quite unsettling to have one of those mangy, parasite infested creatures brush against one’s leg, but they are hungry as many are here. But back to our unsung heroine, Annie Hardwick: these are the conditions that she faces every day. On the ward early, long before the rest of us are required to be at the hospital, and staying late, for sometimes several hours after the last surgery. She wants every child settled in properly before she turns the ward over to the local nurses at night. Each mother or father must be carefully instructed to “water” his or her child every 30 minutes, gently with a 20 cc syringe. The children must not eat or drink anything but clear liquids for two weeks, must not chew, must not smile, must not talk excessively to avoid tearing the delicate tissue and sutures of their newly reconstructed palates and lips. Since language and cultural traditions are barriers, this often requires more than a few, re-translated, reminders and demonstrations. Annie carefully observes and lays hands on each child to determine his, or her, condition. In addition, she trains the local nurses, trains the parents, trains the unskilled volunteer such as me, with infinite wit and wisdom in this 85 degree heated, 99% humidified state of bedlam. And with Annie, comes her abiding sense of wonder of all that exists around her. Life is a Miracle of God to be respected and honored. 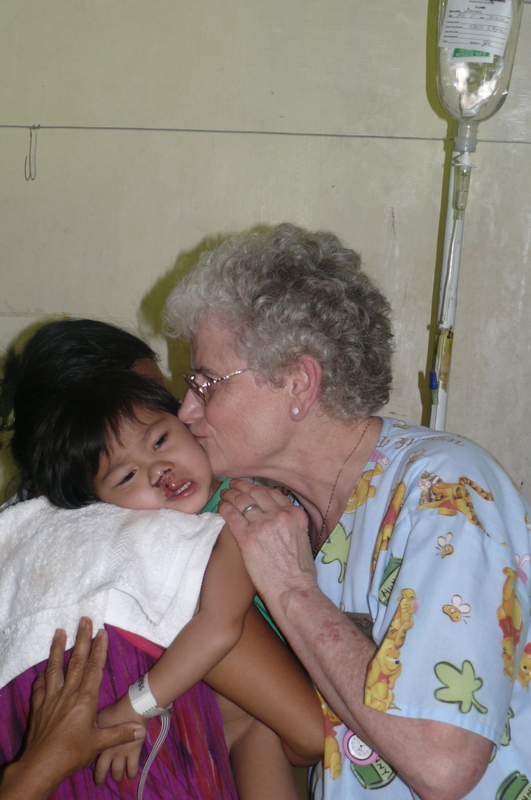 As she efficiently and skillfully cares for each child, you readily catch sight of her compassion and thoughtfulness. In difficult cases that struggle a bit post operatively, she ponders, she tries different approaches, she asks questions, and she never ever hurries to “just get through it all.” She exemplifies that the art of nursing is to ensure that the patient’s well-being is foremost. She truly personifies self-less giving of her life for others. Then she stands in the courtyard between the ward and the operating rooms, taking a quick break, and she quickly spies 3-inch long, neon green caterpillars with glowing, bluish, alien eyes, or a large snail sporting a 4-inch long shell. She pauses and sees all the wonders of creation about her and marvels at them. She is a whole person who in turn can treat a patient as whole person and then step back and still be amazed. And I must mention, before shutting down my computer, that her witty command of the English language leaves us Americans looking rather dull. Her patients’ Moms who catch on quickly are “sensible”, and if not, well… Children who won’t or can’t “settle” are “fractious,”…. I could have applied that term for my own children, frequently. And I was promptly told yesterday, in regard to my feeling a bit achy, that I no doubt was suffering from “supratentorial overlay.” Which of course I had to ask and was informed that it was “all in my head;” I was not being “sensible;” it was only the heat. And finally, per Annie, I should “Foxtrot Oscar” before my readers become senseless with my babbling. Polite British version of “taking my leave has become imperative.” Annie is really a humble person, and I hope I shall have thoroughly embarrassed her, because she deserves to be richly praised. She is truly God’s healing hands.